Seat and backrest are constructed from .075 (14 Gauge) steel. Sides are constructed from .250 (1/4 inch) steel plate with 2 cup holders. Stainless steel hardware is included for durability and easy assembly. The classic Shiner Beer colors red, yellow and brown are a baked-on high-quality super polyester industrial powder finish. 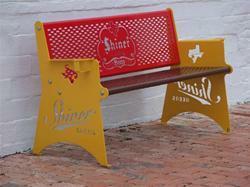 The Shiner Beer Bench comes with your choice of the Shiner Bock or Shiner Beers logo on the side. Legs have mounting holes for wood or concrete anchoring. 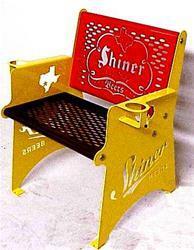 Height 33" Width 58.5" Depth 21"
The Shiner Beer Chair seat and backrest are constructed from .075 (14 Gauge) steel. Sides are constructed from .250 (1/4 inch) steel plate with 2 cup holders. Stainless steel hardware is included for durability and easy assembly. The classic Shiner Beer colors red, yellow and brown are a baked-on high-quality super polyester industrial powder finish. Legs have mounting holes for wood or concrete anchoring. Height 33" Width 32.75" Depth 21"
Shiner Metal Chair $595 FREE SHIPPING!